North American Class 8 truck orders erupted in March to surpass 46,000. That was more than double the volume compared with a year earlier, and remaining production slots for later this year are fast disappearing, ACT Research Co. reported. Preliminary net orders totaled 46,900, according to ACT, which said truck makers’ final numbers would be available mid-April. A year earlier, 23,215 net orders were reported. March was marked the third consecutive month that Class 8 orders rose above 40,000. ACT forecast North American production this year would top out at 325,000, a 27% jump from 255,600 in 2017. Also, private fleets may be playing an expanded role in rising truck orders given the extremely tight capacity and rising rates at for-hire carriers, one economist said. Because contract and spot rates are shooting up, companies with private fleets may be trying to “boost” the size of their fleet and do more hauling, rather than “farming out” loads to for-hire carriers, American Trucking Associations Chief Economist Bob Costello said. Costello said the driver shortage in 2017 was a little more than 50,000, which was an all-time high and works out to be 10% of the total of drivers in for-hire longhaul trucking. His warning to the industry — motor carriers and shippers — is that if things do not change, the shortage could reach 175,000 by 2026. Costello’s trend analysis comes at a time when the market is “hypersensitive to that,” Tam said. At the same time, research firm FTR pegged the preliminary order total at 46,300. “When times are good like this, you have to produce and build all you can,” said Don Ake, vice president of commercial vehicles at FTR. FTR’s forecast is for North American production to reach 330,000 Class 8 trucks this year. Ake, Tam and financial analysts covering the trucking industry agreed the March volume landed as a surprise. When times are good like this, you have to produce and build all you can. Pointing to what he said was ACT’s assumption of a backlog now of 197,000 Class 8 trucks, Baudendistel said that puts production out through October. “Of course, most carriers have preferred OEMs, and once that is considered, it is easy to see why some fleets may not get the trucks they want delivered by this fall,” he wrote. 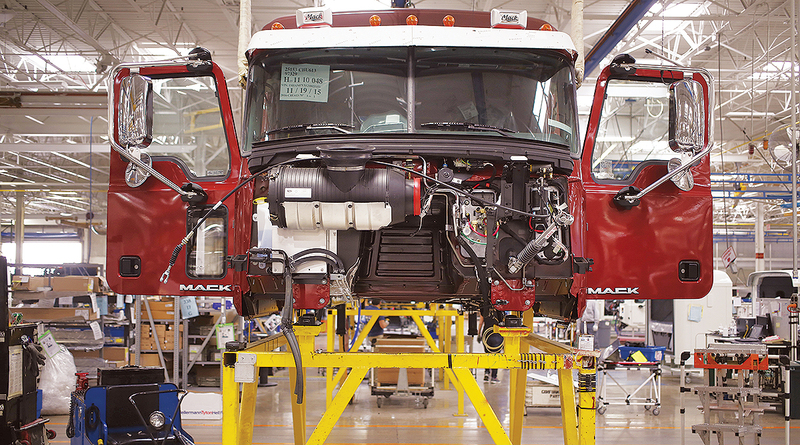 That congestion may present Navistar Inc. with a chance to attract the spillover. Navistar is the parent company of International Truck, which has battled back from widespread concerns about its earlier engines. “We believe getting more International trucks in the hands of more fleets sooner, which should happen with OEM production constraints, could only work to more quickly alleviate quality concerns,” he wrote. In a related development, the used Class 8 market has strengthened and stabilized, and as more quality used trucks come into the market, that could create some pressure on orders for new trucks, Navistar Chairman and CEO Troy Clarke, said in a quarterly earnings call in March.